Former entertainer Rolf Harris allegedly assaulted seven women and girls in a series of "brazen" attacks over a period of 30 years, a court has been told. The 86-year old denies seven charges of indecent assault and one of sexual assault and is appearing at Southwark Crown Court via video link. The alleged victims were aged between 12 and 42, the jury was told. All of the alleged assaults occurred in "public settings", the court heard. The alleged assaults, which are said to date between 1971 and 2004, could all be described as "unwanted groping", the court heard. Jonathan Rees QC, for the prosecution, said the alleged crimes took place "when there were other people in the near vicinity". He told the court: "None of these assaults is alleged to have happened in private." Mr Rees suggested the entertainer's celebrity status made Mr Harris "apparently so brazen" in carrying out the alleged assaults. Mr Harris is appearing in court via a video link from Stafford Prison. The trial is expected to last five weeks. The court heard that Mr Harris is serving a sentence for a series of offences of indecent assault carried out on four female victims. This is a highly unusual case. A man who achieved fame and fortune through television is on trial via a screen. We've got used to seeing "celebrity" defendants arriving at court for high profile cases. Often they're flanked by family and friends. Some try to avoid the cameras, others stop to pose for pictures. Rolf Harris doesn't have to run the gauntlet in that way. He isn't actually here in the courtroom on London's South Bank. Instead he is watching and listening to proceedings over a video link. Everybody in court can see him, sitting at a desk, smartly dressed in a dark suit, white shirt and tie. Occasionally he puts his head in his hands, sometimes he takes his glasses off to rub his eyes. Despite his 86 years, the white hair and neatly trimmed beard make him instantly recognisable, somehow even more so because he appears - as most of us are used to seeing him - on a screen fixed to the courtroom wall. Among the allegations are that Mr Harris inappropriately touched girls on separate occasions when asked to sign autographs. On one occasion, he is alleged to have pulled a 14-year-old girl onto his lap and put his hand up her skirt at a youth music event in London in 1971. The jury heard that the alleged incident left the girl "shocked and frightened". The complainant said she was not able to watch television if Mr Harris was on it, claiming: "I have to turn over." Mr Harris is also said to have put his hand up the skirt of a 12-year-old girl when she went with her mother to get an autograph in Portsmouth. Another alleged victim was a 27-year-old disabled and blind woman. Mr Rees said Mr Harris "crouched down, kissed the back of her neck and... began slobbering over her." Mr Harris is alleged to have placed his hand under the clothed breast of a 13-year-old girl after attending children's television show Saturday Superstore at BBC Television Centre in west London in 1983. 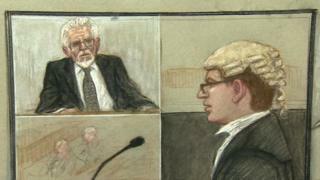 Mr Harris is said to have stroked the lower back of an 18-year-old woman at a music studio near London Bridge in 2002. A then BBC employee, aged 42 at the time, has accused Mr Harris of grabbing her breasts and thrusting his crotch against her at an event after the filming of a television show in 2004. In his closing remarks, Mr Rees said the truth was that "Mr Harris's appetite for sexually assaulting young girls and women" had led him to commit the alleged offences, telling the jurors they must make their own minds up if this was so. Judge Alistair McCreath ruled last year that Mr Harris' age and health meant he should not have to attend the trial in person. He told jurors in December: "We can very happily try Mr Harris without him having to be here... it naturally makes a lot of sense for him to attend his trial remotely." On Monday, jurors paused in front of the camera so that Mr Harris could see them and say whether he knew any of them. Witnesses would be hidden from Mr Harris's view by screens, the court heard.